The concept of nirvana is a product of Buddhist systematic thought which is more than 2500 years old. Throughout the centuries various scholars and philosophers tried to explain the Nirvanic concept using their limited knowledge. Nevertheless the concept of Nirvana is often misunderstood and sometimes misused (e.g. - Nirvana Rock Band, Nirvana Night Club). Although the concept of Nirvana is difficult to explain in mundane terms some scholars have erroneously tried to interpret Nirvana as an exotic place, sensational feeling, or a void entity. The concept of Nirvana was originally explained by the Lord Buddha (566-486 BC). His Lordship reached Enlightenment, at the age of 35, awakening to the true nature of reality, which is Nirvana (Absolute Truth). The word Nirvana comes from the root meaning 'to blow out' and refers to the extinguishing of the fires of greed, hatred and delusion. Nirvana literally means extinguishing or unbinding. This "extinguishment" is not understood by Buddhists to mean annihilation. When these emotional and psychological defilements are destroyed by wisdom, the mind becomes absolutely free. Once these Kleshas (unwholesome actions including ignorance, attachment, and aversion) are totally overcome, a state of bliss is achieved and there is no longer the need the cycle of birth and death. Nirvana is neither complete nothingness nor existence being in the way that these words are usually used (Johansson, 1970). According to Lankavatara-sutra Nirvana is the extinction of suffering through gradual training of purification. The concept of nirvana has been explained through metaphors. In the culture in which the historical Buddha lived and taught, it was understood that fire "burns" and becomes visible when it is attached to fuel, and it stops burning and becomes invisible when it is "released" from fuel. The fire, it was thought, was not annihilated but transformed (Barbara O'Brien). In the Buddhist context nirvana refers to the imperturbable stillness of mind after the fires of desire, aversion, and delusion have been finally extinguished (Gombrich , 2006). Magee (2007) narrates how Siddhartha Gautama attained enlightenment: …..Siddhartha then sat down underneath the famous bodhi tree in Bodh Gaya and vowed not to arise until he attained enlightenment for the sake of all sentient beings. After seven weeks in this one spot he attained his goal. Before he reached enlightenment he had to endure one last onslaught from the forces of sensual attachment embodied by the demon Mara, but with his meditative concentration he broke free from those snares and attained the Goal. He realised the cycle of birth and death was all the cause of ignorance of one's true nature, and he could see how he himself had to go through many such births as a result of that ignorance. He realised the impermanence of all things and how we suffer because we cling to the ephemeral things in life. Most importantly, he realised the steps to liberate oneself from it - the teachings which have now come to be known as the eightfold path. He had now become the Buddha. According to this narration Siddhartha Gautama had to fight his own Kleshas or states of mind such as anxiety, fear, anger, jealousy, desire, depression, afflictions, defilements, destructive emotions, disturbing emotions, negative emotions, mind poisons, etc While fighting these Kleshas and ten defilements -greed (lobha) hate (dosa) delusion (moha) conceit (māna) wrong views (micchāditthi) doubt (vicikicchā) torpor (thīnaṃ) restlessness (uddhaccaṃ) shamelessness (ahirikaṃ) recklessness (anottappaṃ) obviously a ricochet or bounce back impact occurred. The Kleshas started adhere vigorously. This intra psychic conflict is depicted as Siddhartha Gautama’s encounters with Mara the Tempter in the Buddhist texts. Siddhartha Gautama defeated the Mara the Tempter or the id component which is the unorganized part of the personality structure that contains a human's basic, instinctual drives. Siddhartha Gautama had a sudden insight into a transcendental truth and attained enlightenment. It was the greatest self-realization a human can achieve. It was the supreme insight and grand awakening. It was a state of perfect knowledge or wisdom, combined with infinite compassion (Ricard , 2010). Enlightenment is the ultimate state of spiritual development attained by the complete eradication of craving and release from the endless cycle of life. An enlightened person will have developed an intuitive wisdom (sati panna) which enables him or her to see clearly the true nature of the world, i.e. the three characteristics of existence, namely, dukkha (suffering), anicca (impermanence or the transient nature of things) and anatta (non-existence of a permanent soul). The goal of Buddhism is to become enlightened and reach nirvana. Nirvana is believed to be attainable only with the elimination of all greed, hatred, and ignorance within a person. Nirvana signifies the end of the cycle of death and rebirth. Nirvana has been described as a perfect condition. The Buddha used Nirvana more as an image of freedom (Thanissaro, 1996). Nirvana is a huge theme of positive psychology. Nirvana is not something that comes about from a concatenation of causes that springs into existence as a result of an act of creation or an agglomeration of causative factors; it was never created; it always was, is and will be. But due to the moral and mental darkness of ordinary, sansarically benighted sentient beings, it remains hidden from un-awakened perception. D. T. Suzuki-Professor of Buddhist philosophies claims that nirvana refers to the extinction not of existence, but rather of the ego and its desires (Spiro, 1992). It is a state of mind in obtaining higher spiritual states by losing ego and losing concepts ( Dattilio, 2008) and beyond space, there is no causation, no boundary, no concept of self and not-self and thus Nirvana is infinite. According to Buddha Nirvana is the highest happiness. Nirvana is a transformed state of personality and consciousness (Shcherbatskoĭ & Stcherbatsky , 1989). Jung believed that enlightenment experience of satori (awakening) as the "unsurpassed transformation to wholeness. In addition he acknowledges the inadequacy of Westerners' attempts to comprehend satori through the lens of Western intellectualism (Suzuki & Jung, 1948). Eric Fromm concluded that a humanistic religion like Buddhism is geared to achieve the greatest strength, not the greatest powerlessness; virtue is self-realization, not obedience. As viewed by Fromm the aim of Buddhism is liberation from suffering. David Brazier - a British author and psychotherapist highlighted that the concepts of enlightenment, nirvana and the four Noble Truths, free from mystification. He further says that Nirvana is without strife. According to Epstein (2008) Nirvana was the Buddha's way of describing the freedom he found when he saw through the mirage of the self .The Buddha's nirvana is not a drive toward death or disintegration, as Freud naively assumed; it is an ability to accept death and disintegration without falling apart; without twisting, distorting or tormenting the mind in response. Nirvana is in a category of its own. (Javanaud, 2013). Nirvana is a hard concept to attempt to explain (Doshi, 2009). Achieving a state of Nirvana is accomplished with a realization of a higher state of mind. Using a higher cognitive brain function can progress a person to the advanced level of reasoning needed to even comprehend the concept of Nirvana (Doshi, 2009). The human brain has the capacity to understand the insights of Nirvana. Human brain comprised of over 1 billion neurons; and amongst those neurons, there are countless connections. Humans have the intellectual capacity for perception, consciousness, self-awareness, and volition. They have cognitive abilities to learn, form concepts, understand, apply logic, and reason, including the capacities to recognize patterns, comprehend ideas, plan, and problem solve, make decisions, retaining, and use language to communicate. Human brain has unique qualities such as plasticity. Plasticity is an intrinsic property of the human brain and represents evolution’s invention to enable the nervous system to escape the restrictions of its own genome and thus adapt to environmental pressures, physiologic changes, and experiences (Leone et al., 2005). The Contemporary Neuropsychology studies indicate that human brain is more advanced and capable of higher psychological functions. Current research on cerebral asymmetry and behavioural laterality, cerebral fine structure, cerebral neurochemistry, the cerebellum, thalamocortical pathways and the pituitary–hypothalamic axis have shown that human mind is an extraordinary system which is million times advanced than the newest computers. Recent advances in the brain imaging techniques such as rCBF (regional Cerebral Blood Flow), real time MRI (Magnetic Resonance Imaging), MEG (magnetoencephalography), and improved EEG (electoencephalography) have revealed higher brain functions and change of neurochemistry during meditation and in spiritual awakening moments. Meditation and spiritual awakening have been associated with structural changes in brain and increase in brain blood flow. Studies have revealed an increased fractional anisotropy and greater thickness in the anterior parts of the corpus callosum in meditation practitioners compared with control subjects (Kurth et al., 2014). Luders, Clark, Narr and Toga (2011) surmised enhanced brain connectivity in long-term meditation practitioners. Moore and Malinowski (2009) showed that mindfulness was intimately linked to improvements of attentional functions and cognitive flexibility. Davidson and colleagues (2003) suggested that mindfulness meditation may change brain and immune function in positive ways. Chen and colleagues (2012) highlight that meditation helps to break anxiety symptoms. Kurth and colleagues (2014) suggest that the positive correlation between meditation practice years and asymmetry near the posterior intraparietal sulcus may suggest that meditation is accompanied by changes in attention processing. Luders and team (2012) state that possibility of bridging the hemispheres in meditation and close link between long-term meditation practices and the structure of the corpus callosum. Morphometric studies have found differences between mediation practitioners and controls in a number of brain regions. Some of the changes were recorded in insula, hippocampus, prefrontal cortex, and brainstem (Ott et al., 2011). In addition dynamic pattern of white matter change involving the anterior cingulate cortex a part of the brain network related to self-regulation has been found (Tang et al., 2012). Activation of brain areas involved during moments of higher states of consciousness have been noticed by many researchers (Glaser, 2008). Several recent studies show that meditation activates frontal brain areas associated with attention focusing and physical relaxation (Davanger et al., 2010). Taylor and colleagues (2011) showed mindfulness induced a down-regulation of the left amygdala during emotional processing. Hölzel and team (2011) found that Mindfulness-Based Stress Reduction was associated with changes in gray matter concentration in brain regions involved in learning and memory processes, emotion regulation, self-referential processing and perspective taking. Moreover Westbrook et al (2013) demonstrated mindful attention reduced functional connectivity between craving-related regions in the brain. Pagnoni and Ceand (2007) used Voxel-based morphometry for MRI anatomical brain images and a computerized sustained attention task were employed in 13 regular practitioners of Zen meditation and 13 matched controls. They concluded that regular practice of meditation may have neuroprotective effects and reduce the cognitive decline associated with normal aging. Leung and colleagues (2013) found greater gray matter volume in the left temporal lobe in the people who practiced loving-kindness meditation and they concluded that loving-kindness meditation may influence brain structures associated with affective regulation. Attaining Nirvana is a form of cognitive insight phenomenon and it is a great aha moment. Recent work has revealed insight-related coarse semantic coding in the right hemisphere and internally focused attention preceding and during problem solving (Kounios & Beeman , 2014). During the Aha! reaction Luo, Niki and Phillips (2004) observed anterior cingulate and left lateral prefrontal cortical activation. According to Auble and Soraci (1979) aha! effect or epiphany is a memory advantage. Sandkühler and Bhattacharya (2008) investigated the neural mechanisms of aha moments and found strong gamma band responses at parieto-occipital regions, an increased upper alpha band response in right temporal regions and greater cortical excitation in right prefrontal area. As described by Friedrich Kekulé the ring structure of benzene came to him as a form of aha moment in a dream where a snake was eating its own tail. Also Srinivasa Ramanujan an Indian mathematician who had no formal training in pure mathematics made extraordinary contributions to mathematical analysis, number theory, infinite series, and continued fractions. According Ramanujan most of these complex mathematical formulas came to him as visions. These examples show that advanced cognitive functions could occur in the unconscious mind. In 1666 Sir Isaac Newton observed an apple falling to the ground and in his mind he experienced a cascade of thoughts with an immense insight which helped him to develop the theory of universal gravitation. In 1907 Albert Einstein watched trains moving into the station past rows of clocks that were synchronized with the one atop the famed Bern tower and this observation helped Albert Einstein to develop the theories of special and general relativity. Sudden comprehension insight is an accepted psychological phenomenon (Smith & Kounios, 1996; Sternberg & Davidson, 1995) and it associated with measures of intelligence and creativity (Ansburg & Hill, 2003; Davidson, 1995). According to Adam Galinsky of the Kellogg School of Management Conscious thought is better at making linear, analytic decisions, but unconscious thought is especially effective at solving complex problems. There are two general cognitive strategies which people use to solve problems. Search involves systematic evaluation of possible problem states intervening between the current state and the goal state, and the use of available operators to transform one state into another. The use of a search (or “analytic”) strategy involves systematic evaluation of problem states which lie on different possible paths linking the starting state and the goal state. These intermediate states and paths are computed by deliberate, predominantly conscious, manipulation of problem elements (Ericsson & Simon, 1993; Newell & Simon, 1972). Kounios and colleagues (2008) researched the origins of insight in resting-state brain activity and point out that general strategy for problem solving involves insight (Bowden et al., 2005; Maier, 1931; Sternberg & Davidson, 1995; Wagner et al., 2004). Insight is the sudden awareness of the solution to a problem (i.e., the “Aha!” phenomenon) with little or no conscious access to the processing leading up to that solution (Metcalfe & Wiebe, 1987; Smith & Kounios, 1996). The notion of sudden insight is related to the distinction between discrete, all-or-none, information processing and continuous or incremental processing (Kounios, 1993; Kounios et al., 1987; Meyer et al., 1988; Sergent & Dehaene, 2004; cf. Lang et al., 2006), and has been identified as an important characteristic of creative thought (Andreasen, 2005; Ansburg & Hill, 2003; Friedman & Förster, 2005). Human mind is thought to be the seat of perception, self consciousness, thinking, believing, remembering, hoping, desiring, willing, judging, analyzing, evaluating, reasoning etc. The human has an extraordinary powerful surge of spiritual energy. With the development of higher consciousness that people could gain a greater connection to, and Knowing of inner self and to become spiritually powerful. The human brain has a natural healing system. Especially in psychological trauma this system activates. This natural healing system was elegantly described by Dr Francine Shapiro in her EMDR (Eye Movement Desensitization and Reprocessing) theory. As Dr. Shapiro explains all humans are understood to have a physiologically-based information processing system. In War and Peace Leo Tolstoy states: human mind: “In the first case we had to surmount the sensation of the unreal immobility in space and to admit a motion we could not perceive of by sense. In present case it is as essential to surmount a consciousness of an unreal freedom and to recognize a dependence not perceived by our senses. 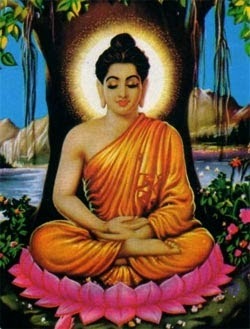 Siddhartha Gautama meditated for forty-nine days under a Bodhi tree and attained enlightenment. During this time period he critically analyzed the knowledge which he gained from his former mentors- Udaka Ramaputta and Alara Kalama. Adding up Siddhartha Gautamaused his practical knowledge of six year painful exertion (dushkara kriya) and other life experiences. Sitting under the Bodhi tree by the river Neranjara he overcome the last of his inner demons and break through to the truth of his existence, finally reaching the cessation of his human suffering. He became the Buddha, the Awakened One (Tsering , 2005). Enlightenment results from the state where the conscious mind is potentiated of energy through long practice and discipline, working with meditation. Siddhartha Gautama had a preparatory brain-state to understand the universal truth. Nirvana is cognizable by mind. In other words human mind can be trained in higher cognitive functions. When the mind reaches higher state it can understand great truths about nature and universe. Realization of Nirvana is a form of achieving superior mental state. It is a state in which one experiences the unity and the wholeness of everything as it is. This unity and interconnectedness of all things is, from a Buddhist perspective, objective reality. Nirvana is a process described as completely purifying the mind of the defilements of greed, hatred and delusion. This ideal assumes that the mind can be permanently and completely purified and therefore transformed (Rubin 1996). Nirvana is attained as a result of transformation – a transformation is a state of self-fulfillment, realistic self-evaluation, freedom from inner conflicts and a stable emotional life (Srivastava , 2010). Johansson (1969) states that Nirvana is a metaphysical state transcending time, space and causality, "a supra-mundane reality, with independent existence", attained by merging into this reality, and suggests that the terms ajatam, amatam, akatam, asankhatam, usually translated "unborn, deathless, unmade, uncompounded", are more correctly rendered "freedom from birth, freedom from death, freedom from creation, freedom from putting together". If this were correct it would "set us back to the personal plane with which discussions of Nirvana are usually concerned". In his book Essence of the Heart Sutra, His Holiness the Dalai Lama defined Nirvana as the "state beyond sorrows," or a "state of freedom from cyclic existence." Nirvana is more than just the destruction of defilements and the end of Samsara. It is a reality transcending the entire world of mundane experience, a reality that transcends all realms of phenomenal existence. The Buddha also refers to nirvana as a "state" (pada). He calls it amata-pada, the "deathless state" and accuta-pada, the imperishable state ( Bodhi ,2009). An important facet of Nirvana in general is that it is not something that comes about from a concatenation of causes that springs into existence as a result of an act of creation or an agglomeration of causative factors; it was never created; it always was, is and will be. But due to the moral and mental darkness of ordinary, sansarically benighted sentient beings, it remains hidden from un-awakened perception. There are four progressive stages culminating in full enlightenment as an Arahat (a perfected person who has attained nirvana).These four stages are Sotapanna, Sakadagami, Anagami, and Arahat. The Buddhist literature recounts that as children Vishaka , Rahula and Sopaka were able to attain the first Sotapanna stage. Kujjuthhara – an illiterate servant of the queen Samawathi attained Sotapanna when she accidently heard a sermon. These stories specify that the realization of Nirvana is not an impossible task and it is an attainable goal. Human brain has the capacity to grasp the essences of Nirvana. The enlargement and species-specific elaboration of the cerebral neocortex during evolution holds the secret of humans’ mental abilities. The neocortex of human is a thin, extended, convoluted sheet of tissue with a surface area of ~2600 cm 2, and thickness 3–4 mm. It contains up to 283109 neurons and approximately the same number of glial cells (Mountcastle, 1997). Neocortex is considered to be the crowning achievement of evolution and the biological substrate of human mental prowess (Rakic, 2010). Neocortex is involved in a variety of higher cognitive functions. Neocortex contributes to the encoding, storage and retrieval of declarative memories. Considerable evidence indicates that the human cognitive system comprises two subsystems, one rational-scientific and the other intuitive-spiritual (Randrup, 2002). Vaillant (2008) states that spirituality is a psychological experiences of religio-spirituality that relate to an individual's sense of connection with a transcendent power with feelings of awe, gratitude, compassion and forgiveness. Spirituality reflects positive emotions such as love, hope, joy, forgiveness, compassion, trust, gratitude and awe which generated by the limbic system.Negative emotions such as fear, anxiety, sadness and anger are often crucial for survival. The positive emotions are more expansive and help broaden and build (Fredrickson, 2001). Positive emotion and spiritual experience cannot be disentangled (Vaillant, 2008). Vaillant (2008) states that items from Robert Cloninger's (1994) Scale of Self-Transcendence has allowed neuroscientists and geneticists to demonstrate that neural experience of spiritual experience is in part genetic (Hamer, 2004; Eaves, 1999) and that spiritual experience becomes visible with brain-imaging studies (Newberg and D'Aquilli, 2001). Homo sapiens ' limbic system plays the greatest role in spirituality (Hamer, 2004; Vaillant, 2008). Recent discoveries of primate altruistic attachment (Harlow, 1958; Bowlby, 1979; Zubietta, 2003) and primate empathy via spindle cells (Allman et al. , 2001, 2005) and via mirror cells (Carr et al. , 2003; Rizzolati, 2005) highlight that human is capable of esteem behavior and achieve spiritual advancement. Vaillant (2008) conclude that for selfish reptiles to evolve into loving mammals it took the genetic evolution of our emotional limbic system. For loving, playful passionate mammals to become reflective, cause-seeking, mythmaking Homo sapiens it took the genetic evolution of our huge human neocortex. These transformations concur that human has the capacity to develop his spiritual dimension further attaining Nirvana. Although potential forms of consciousness lie beneath human cognitive system many individuals go through life without suspecting their existence. Providentially Vishaka , Rahula , Sopaka and Kujjuthhara had awakening moments and they were able to utilize these potential forms of consciousness. The traditional “problem” of nirvana concerns rather the question, “What happens ... and impermanence, but no language or concepts can properly describe it. ... the analogy of a tortoise unable to describe to a fish the experience of dry land (Collins, 1998). Ludwig Wittgenstein asserted that the limits of our language mean the limits of our world. The words in our limited vocabulary cannot explain the truths about the universe. Plato's "Allegory of the Cave," from "The Republic," Book specifies the limitations of five sensors to perceive the world. In Plato’s Allegory of the Cave people may acquire concepts by their perceptual experience of physical objects. But they would be mistaken if they thought that the concepts that they grasp were on the same level as the things they perceive. With his Allegory of the Cave, Plato presents a scene of prisoners in a cave. These prisoners are in chains at the back of the cave facing the back wall. They have been there all their life and their chains keep their heads immobile so they are unable to look around. Behind the prisoners and before the opening to the cave is a fire. In front of the fire are puppeteers that hold objects up over a screen so that their shadows from the fire are cast on the back wall of the cave. These shadows are all that the prisoners have been able to see their whole lives; therefore, the prisoners take the shadows to be the actual items. As Plato says, “such persons would certainly believe that there were no realities except those shadows of handmade things (Haymond, 2005). The Gay Science and Will to Power, Nietzsche comments on Buddhism characterizing it as an effort to withdraw from pain into an 'Oriental Nothing - called Nirvana', by way of following the maxim 'One must not act'. In The Genealogy of Morals, Nietzsche categorizes Buddhism as one among a group of ideologies that promote '...nihilistic turning away from life, a longing for nothingness, or for life's 'opposite', for a different sort of 'being'' According to Nietzsche, Buddhism can be described as an effort, through restraint from action, to escape suffering and pass into absolute non-existence. However both Nietzsche and Schopenhauer greatly misunderstood Buddhism, by interpreting Nirvana as non-existence. (Moad, 2010). Nirvana is not regarded in the main Buddhist tradition as simply the psychological state of un-selfcentredness. Nirvana as a psychological state constitutes the immanence of the ultimate within human life. (Hick - 2004). It does not come under nihilism. Buddhism denies that the life is without objective meaning, purpose, or intrinsic value. According to Johansson (1969) Nirvana is a psychological, ethical, or metaphysical state, or a combination of them all. Nirvana "can be an object of knowledge and vision, feelings, desire, approach, acquisition and production". A distinction is made between emotions and feelings; the latter are defined as "the experiences of pleasure or discomfort that normally accompany our perceptions and other conscious processes". These may become strong under pressure, but emotion is "a state of imbalance such as anger, hate, fear, anxiety, elation and love", so that the state of the arahant is one of calm in which feelings are experienced without emotional reaction. Although Nirvana is a state of freedom from needs, emotions and all sensuality, it is also a state brought about by transformation of citta, "the core of personality", defined as a combination of mind and personality, the change taking place through practical and intellectual effort,—a causal process. (Johansson, 1969). Buddhist tradition distinguishes between the experience of someone who reaches nirvana during their lifetime (sopadhiśeṣa-nirvāṇa) and the experience of nirvana after death (nir-upadhiśeṣa-nirvāṇa). The experience of nirvana-in-this-lifetime is described as a transformed state of mind that is free from negative mental states, peaceful, happy, and non-reactive. The experience of nirvana-after-death (commonly referred to as paranirvana) is said to be beyond words or description. "There is that dimension where there is neither earth, nor water, nor fire, nor wind; neither dimension of the infinitude of space, nor dimension of the infinitude of consciousness, nor dimension of nothingness, nor dimension of neither perception nor non-perception; neither this world, nor the next world, nor sun, nor moon. And there, I say, there is neither coming, nor going, nor stasis, neither passing away nor arising; without stance, without foundation, without support (mental object). This, just this, is the end of stress." Nirvana is not a logical abstraction that is merely inferred by those who have eliminated craving (Thanha) and ignorance from their mind set; it is something that is ‘personally experienced by the wise (Albahari ,2006). Nirvana can only be explained to the 'unenlightened' by negation. Thus the Buddha tries to explain this deep concept to one of his disciples. He asks whether the fire, when it is extinguished, can be said to have gone north, south, east, or west. Nirvana, however, cannot be described as existing, not existing, both existing and not, or neither existing nor not. Nirvana is a state to be attained here and now in this very life and not a state to be attained only after death. In terms of living experience Nirvana can be characterized by four special attributes: happiness, moral perfection, realization, and freedom. Nirvana is a state of moral perfection. (de Silva , 1996). Nirvana is a condition to be created by self control, wisdom and love. Anger, ill-will, hatred, pride, conceit, indolence, delay in doing the right thing, slothfulness, desire to do evil, exhibiting the spirit of revenge, desire to enjoy unhealthy lustful pleasure, harboring anger, skepticism, self esteem, hypocrisy, running down others, covetousness, arrogance, stubbornness, unyielding to truth, showing partiality, fear, muddle-headedness etc., are obstacles to the realization of Nirvanic happiness. Nirvana is the highest happiness (nibbànaü paramaü sukhaü). In contradiction to worldly happiness it is the permanent (nicca), eternal (dhuva), happy (sukha) and pleasant (subha) state experienced by destroying all defilements. Therefore in conventional terminology, it is the supreme happiness one can think of (Gnanarama, 2000). The Buddha describes the abiding in nirvana as a state of 'deathlessness' and as the highest spiritual attainment, the reward for one who lives a life of virtuous conduct. Nibbana is meant specifically as pertains gnosis that which ends the identity of the mind with empirical phenomena. By definition, Nirvana is freedom from the emotions and desires by which egoism and attachment is created: all definitions are in complete agreement on this point. This does not mean complete absence of motivation, nor passivity. The Arahant is motivated by ‘understanding loving-kindness and 'compassion (Johansson, 1969). Buddhism considers human perfection or the attainment of Arahatship as a good in itself and likewise the material and spiritual welfare of mankind. Whatever is good as a means in bringing about these good ends are instrumentally good and these are called right actions, defined as actions which promote one’s welfare as well as the welfare of others. It therefore propounds the doctrine of ethical universalism as opposed to ethical egoism or ethical altruism. The goal of perfection and happiness (the hedonist ideal) is also therapeutic in that only a perfect person, it is said, has a perfectly healthy mind, which enjoys supreme happiness. Hence the necessity for cleansing the mind, which consists in changing the basis of our motivation from greed, hatred and ignorance to selfless service, compassion and understanding (Jayatilleke, 1978). Venerable Dr. Walpola Rahula explains the concept of Nirvana thus. ...The only reasonable reply is that it can never be answered completely and satisfactorily in words, because human language is too poor to express the real nature of the Absolute Truth or Ultimate Reality which is Nirvana. Language is created and used by masses of human beings to express things and ideas experienced by their sense organs and their mind. A supramundane experience like that of the Absolute Truth is not of such a category. Words are symbols representing things and ideas known to us; and these symbols do not and cannot convey the true nature of even ordinary things. Language is considered deceptive and misleading in the matter of understanding of the Truth. So the Lankavatara-sutra says that ignorant people get stuck in words like an elephant in the mud. Nevertheless, we cannot do without language. It is incorrect to think that Nirvana is the natural result of the extinction of craving. Nirvana is not the result of anything. If it would be a result, then it would be an effect produced by a cause. It would be 'produced' and 'conditioned'. Nirvana is neither cause nor effect. It is not produced like a mystic, spiritual, mental state, such as dhyana or samadhi. People often ask: What is there after Nirvana? This question cannot arise, because Nirvana is the Ultimate Truth. If it is Ultimate there can be nothing after it. If there is anything after Nirvana, then that will be the Ultimate Truth and not Nirvana. He who has realized Truth, Nirvana, is the happiest being in the world. He is free from all 'complexes' and obsessions, the worries and troubles that torment others. His mental health is perfect. He does not repent the past, nor does he brood over the future. He lives fully in the present. Therefore he appreciates and enjoys things in the purest sense without self-projections. He is joyful, exultant, enjoying the pure life, his faculties pleased, free from anxiety, serene and peaceful. As he is free from selfish desire, hatred, ignorance, conceit, pride, and all such 'defilements', he is pure and gentle, full of universal love, compassion, kindness, sympathy, understanding and tolerance. His service to others is of the purest, for he has no thought of self. He gains nothing, accumulated nothing, because he is free from the illusion of self and the 'thirst' of becoming. The concept of Nirvana from psychological point of view. But I don't think one can gain Nirvana if you get rid of ego and its desires also. there are many things that one have to achieve before one can attain Nirvana.